Revolution 4.0 is here to stay and we have to learn to adapt to it. All the eras in which great transformations occurred had their particularities. Today we need to be aware of the ones now prevailing. And contrary to what many people think, it’s not about digitizing and mastering social networks. Nothing could be further from the truth, true transformation is rather, once again, cultural, and will consist of anticipating what is to come. 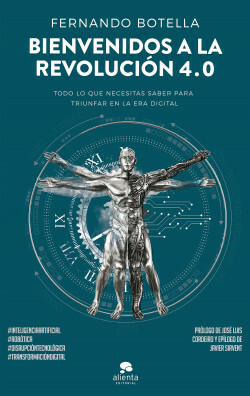 This book guides us with simple, non-technical language from the past to the future, from anthropology, sociology or biology to the technological singularity. In such a changing world we must be proactive in visualizing the great challenges and opportunities of the coming years and decades. The new model of society and business that awaits us will require a new way of thinking and behaving that is much more disruptive. We must weigh the value of creativity much more and try to relate socially to our environment in a different way. In order to be able to move forward, we must look at reality in a different way. Remember that what is happening now is not entirely new: it has already happened in the past. It’s just new to us. The recent past is already history, the future is astonishing and the present is the only temporal place we have to change in the right direction; let’s take advantage of it. How can we make artificial intelligence less artificial and smarter?